Anyone who has tried to build an autonomous robot will appreciate how difficult even the simplest tasks like moving around an indoor room can be. By utilizing a human in the control loop, via a web cam, navigation becomes significantly easier. This project details the creation of a teleprescene robot by combining a netbook running ubuntu with a small robot chassis. The robot is controlled by a desktop computer in a remote location. Both the netbook and the remote desktop computer have video feeds so that two people in different locations can interact, hence the name teleprecence (or remote presence). 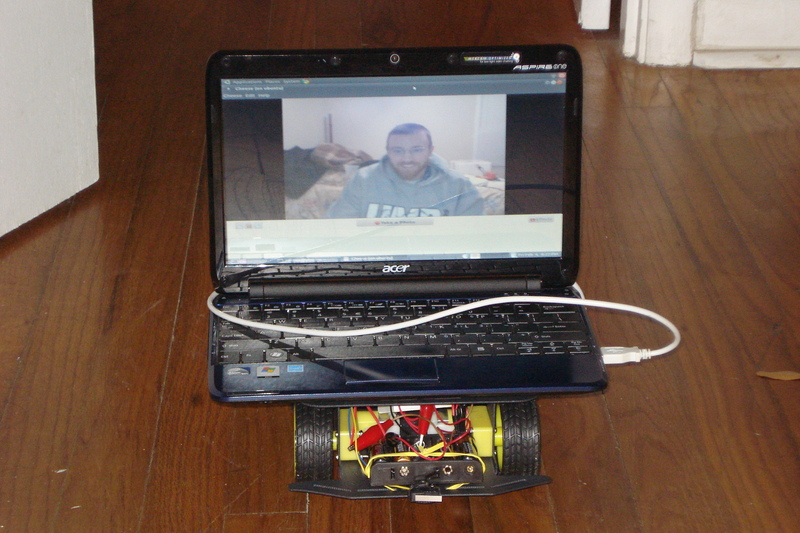 Telepresence robot assembled from a netbook on a small robot chassis. Both the robot and the remote desktop computer are running Ubuntu. Telepresence meetings (ie: video conferencing) has achieved mainstream acceptance. Recently commercial telepresence robots have entered the market selling for $3,000 to $50,000+. IEEE Spectrum brought wide spread attention to the telepresence robot movement with a September 2010 feature article, comercial telepresence robot survey, and instructions for a DIY telepresence robot. The remainder of this article describes how to build and network a telepresence robot using a netbook and desktop both running Ubuntu. The secure shell protocol (SSH) is used to connect the two computers over a wireless network. These instructions demonstrate connecting over a home network, but in theory the SSH protocol can connect two computers anywhere in the world as long as they both have internet access. The following pages describe the mechanical setup where the robot chassis is powered by an Arduino and Adafruit motor controller. All of the arduino source files and commands needed to setup the SSH communication between the two computers is included after the details of the mechanical components. The post concludes with a listing of the source code needed to complete the project. This entry was posted in Project and tagged arduino, camera, motor controler, open source, robot, SSH, telepresence, ubuntu, video, webcam. Bookmark the permalink.